The specialist for power transmission technology and hydraulic accessories has various types of couplings available with ATEX certification, including gear couplings and disc couplings, suitable for various potentially explosive atmosphere applications. Disc couplings with ATEX certification are used in pumps and compressors for hazardous areas, for example in the petrochemical industry. The disc couplings are robust, matching harsh environmental conditions. They function practically without wear and stand out due to their high torsional stiffness and zero backlash. The couplings are maintenance-free and can be tested without disassembly. There are ten series available, covering a torque range from 0.24 kNm to 259 kNm. Aside from the basic designs, different variants with intermediate shafts or spacers are offered. Made for use in the petrochemical industry, there is a series available with an intermediate piece and protective ring, also meeting the requirements of the API 610 norm. Typical applications for gear couplings with ATEX certification are for example pumps, breakers, mixers, presses, steelworks and conveyors. The availability of gear couplings for hazardous areas covers torque values ranging from 0.3 kNm to 5340 kNm. The gear couplings are available in 27 different series, including variants with a flanged or continuous sleeve, with special gaskets as well as with intermediary shaft or spacers. 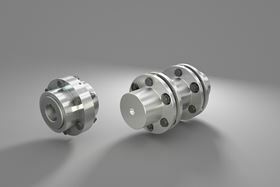 The Spidex couplings by R+L Hydraulics GmbH are axially mountable and should be maintenance free.